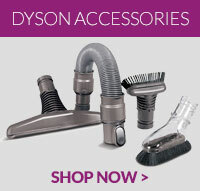 Genuine Dyson manufactured motorhead floor tool assembly for Dyson DC58, DC59 / DC62, SV03 vacu.. If you have misplaced your Dyson vacuum wand or have accidentally broken it, this Dyson manufactured..
Set of 3 replacement tools suitable for Dyson DC14 vacuum cleaners. Replace your lost or damaged Dys..